Want to get interviewed on radio, TV, or podcasts? How about being quoted as an "expert source" in blog articles, newspapers, or magazines? 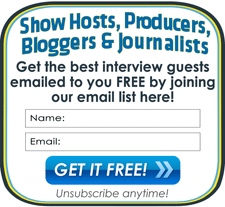 Submit your expert profile to be listed in our Interview Guests Directory! AND THEN SAVE UP TO 58% OFF FOREVER! Talk show producers, radio and podcast hosts, bloggers, and journalists worldwide visit our popular website daily. They are looking for experts sources like YOU to interview "on the air" and in print, too. Our Directory is the #1 Google Ranked search result for "interview guests". List your Guest Expert Profile with us so you can get free interview invitations, too! What's included in your personalized Guest Expert Profile listing? Plus, the upgrade option to include your headshot, book cover, or logo on our website! And, your new listing is emailed to our worldwide email list of talk show hosts, radio and TV producers, podcasters, PR firms, publicists, bloggers, and journalists, too. See and submit the Guest Expert Profile Form here. List Yourself in Interview Categories Specific to Your Expertise! To help show hosts and journalists find you, we have 50 different categories of interview topics to help you target your publicity. For a limited time, TWO category listings are included. But list in more categories to save big and attract more interviews, too! SPECIAL FREE TRIAL & DISCOUNTS! For a limited time, new guest expert invitees like you can try the service FREE for 1 MONTH! And there's NO Set-Up Fee either! After your Free Trial period ends, a basic Guest Expert listing in TWO categories then costs only $5.95/month. Want to include your picture? Add just two dollars more for $7.95/month if you would like us to include your headshot, book cover, product photo, or logo in your website profile. 3 or 4 Categories: $7.95/month 34% Discount! 5 or More Categories: $8.95/month 55% Discount! 3 Categories + Photo: $8.95/month 28% Discount! 4 Categories + Photo: $9.95/month 44% Discount! 5 or More Categories + Photo: $10.95/month 58% Discount! Listing yourself in multiple categories is important. It increases your visibility and offers great discounts, too! You can cancel any time - even before the Free Trial ends. Fill out our easy Guest Expert Profile form here. Upload a 90 x 110 pixel digital photo, book cover, or logo (optional upgrade). Click Submit and set up your monthly subscription. You can use your credit card via Paypal. Then we'll get to work to post your exclusive new Guest Expert Profile in our website directory and in our email newsletter! Cancel any time during the free trial and pay nothing. You can also cancel any time after your free trial has ended. To cancel the recurring charge and have your listing removed anytime, simply visit your Paypal account to cancel there. Please note that your profile is connected to your billing agreement. As soon as you cancel your billing agreement, your listing will be removed. However, we recommend that you keep your Interview Guests Directory listing live as long as possible to help you attract more interview bookings and improve your own web site's SEO search engine optimization! Discounts only apply when all listings are the same and submitted at the same time. Promotional subscription rates are only good until cancelled and cannot be renewed. Cancellation (or credit card troubles like expiration or card replacement) will lead to removal from the site. Reinstatement will be at then prevailing rates. No partial month credits or refunds. This great Free Trial Deal and special introductory price is certain to climb, so if you are interested sign up now to lock-in this low rate.